WASHINGTON, D.C. -- Despite recent federal Food and Drug Administration rules mandating that U.S. restaurants post nutritional information for menu items, Americans are no more likely to peruse this type of information now than they were five years ago. 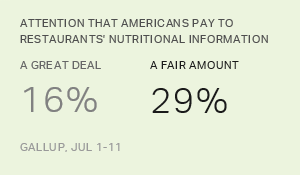 Today, less than half of Americans (45%) say they pay "a great deal" (16%) or "a fair amount" (29%) of attention to nutrition details at restaurants, similar to the 43% found in 2013. How much attention do you pay to the nutritional information that is printed on restaurant menus or posted in restaurants, including calories, sugar and fat content -- a great deal, a fair amount, not much or none at all? Though the national menu labeling policy just took effect in May, New York City passed a calorie count law for restaurants in 2006, and California became the first state to pass such a law in 2008. Since then, other states and municipalities have followed suit -- though similar legislation has stalled in many local governments. This could change given the new federal regulations, as more Americans will see the labels as they dine out this year and in the future. Though a majority of U.S. adults don't pay attention to nutritional information when they dine out, seven in 10 say they pay a great deal (32%) or fair amount (38%) of attention to nutrition labels on food packages. However, most Americans became accustomed to nutrition labels on food packaging in the early 1990s, with the passage of the Nutrition Labeling and Education Act -- so their greater attention to nutritional information on food packaging compared with that on restaurant menus may be related to the length of time this information has been available. Meanwhile, 21% say they don't pay much attention to package labels, and 9% don't pay any attention to them at all. These figures are similar to what Gallup found in 2013 when the question was last asked. How much attention do you pay to the nutritional information that is printed on all food packages, including calories, sugar, fat and vitamin content -- a great deal, a fair amount, not much or none at all? Some Americans pay more attention to food labels than others do. On food packaging, nearly three in four women (74%) say they pay a great deal or fair amount of attention to nutrition labels, while a smaller majority of men (62%) report doing the same. 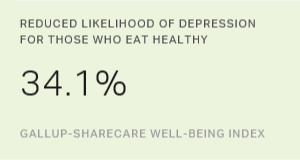 While a slight majority of adults aged 18 to 29 (57%) report paying attention to food package labels, at least seven in 10 adults in each older age group say they do. One of the largest differences is seen among education groups. While 80% of college graduates note nutrition details on food packaging, 63% of those who did not graduate from college say they pay attention to such labels. And among income groups, wealthier Americans are more likely than lower-income adults to pay attention to labels. These differences are similar for food labels at restaurants, where half of women, college graduates and wealthier Americans review menu nutrition details -- the largest percentages among each subgroup. As restaurants acclimate to new federal regulations on menu labeling, diners may start paying more attention to an establishment's nutritional information. Since a sizable minority of Americans currently report paying attention to nutrition labels at restaurants, the new rules could push the percentage who read them past the majority level. Many U.S. adults currently review food packaging labels, which became required for food distributors in the early 1990s -- so the habit of checking nutritional values may become more commonplace in restaurants over time. Certain groups outpace others when it comes to reviewing nutritional information, but this may partly reflect demographic differences. Many college students, for example, are required to take courses in which nutrition is part of the curriculum, or they may be exposed to more nutritional information in their general education. Meanwhile, lower-income Americans may pay more attention to other details when shopping for food, such as bulk size or price, than they pay to nutrition labels.